On the last day of SXSW Interactive 2007 I was having lunch with a bunch of people at Jo’s, including Mike Hudack of blip.tv. We knew that the closing party would probably be crowed and have loud music, making it hard for people to socialize, so Mike and I decided to organize our own little Drinkup at Ginger Man, hosted blip.tv and Laughing Squid. So at 1:30pm I sent out a single Twitter post and let it grow from there. Word spread via Twitter and offline and by the end of the night, our last minute event was packed with our friends. We had our own little Twittermob going on. 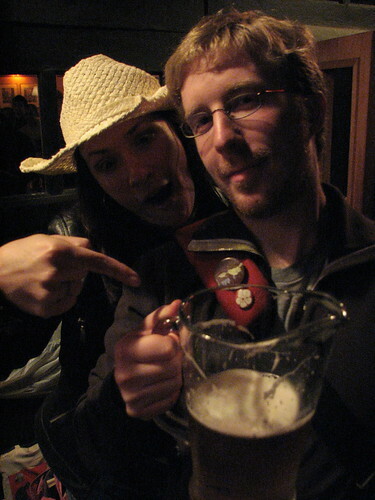 So as the sponsors of the Drinkup, blip.tv and Laughing Squid took turns buying pitchers of beer for everyone who showed up. When it came time for Laughing Squid’s third round, Mike’s friend from Eyespot offered to buy the next round. So I thought great, we have a new sponsor and I announced it via Twitter. Alex Williams of Podcast Hotel heard about it and he wanted to buy a round as well. And so it went. On the spot we came up with a spontaneous microsponsorship model that ended up providing more than enough beer to make it to closing time. Other sponsors included Citizen Agency, Mag.nolia, Carson Systems and Emurse/We Know HTML, all announced via Twitter. In fact we had a backlog of sponsors that we couldn’t even get to, including individuals. Violet Blue has an excellent write-up on our Twittermob. 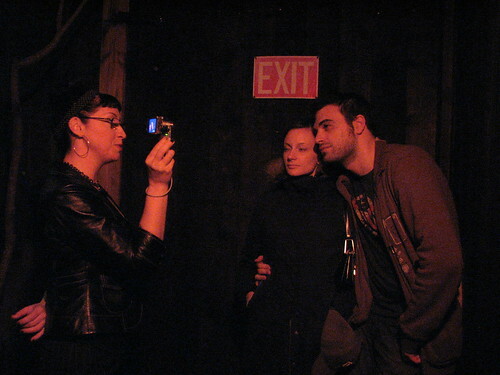 I had retired my camera for the night, but luckily Eric Skiff shot a bunch of great photos of the Drinkup.